One of my many guilty listening pleasures has always been the glam/sleaze metal that dominated the airwaves of the mid to late '80s, an unapologetic raunchy style that provided the soundtrack for my high school years. While the memories come rushing back whenever I hear those classic tunes, I still enjoy unearthing bands that to this day are giving their all in tribute to the Aqua Net and Spandex of days gone by. Germany's Hollywood Burnouts have gone full '80s on their aptly named debut release, Excess All Areas, emulating with reckless abandon the carefree and hard-partying attitude of their sleaze-metal influences. Not only have the guys (and girl) of Hollywood Burnouts nailed the '80s metal look, they've expertly recreated the sound perfected by bands such as Poison, Faster Pussycat, and Guns 'n' Roses. When capturing the essence of any past musical style, modern bands walk a fine line between imitation and plagiarism. Most manage to avoid a blatant rip-off, though a chord here or there may have more than a passing familiarity to it. The majority of Excess All Areas has that fresh familiarity to it that fans of the style look for from new artists. Guitarist Chrizzy Roxx, along with frontman Mike Nazzty, lays down riff upon decadent riff of C.C. Deville-inspired fun to tease those old-school memories out into the open. "Hands Of Rock", the album's lead-off and standout track, exemplifies the Hollywood Burnouts formula with its upbeat grooves, gang choruses, and Angus Young-esque solo. 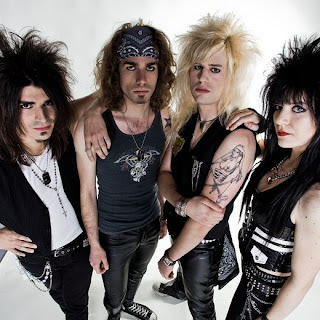 As catchy as anything delivered by the hair metal masters back in the day, Excess All Areas fires both barrels to deliver a healthy mix of squealing rockers and introspective ballads. Of the latter type, "A Part Of My Heart" is the strongest. Its soft piano and acoustic guitar interplay provides a well-timed break from the balls-out pace of the album's first two cuts. The album's final ballad, "Remember Me", closes out the party with a nice Irish flute melody - something definitely not common in '80s metal. The album's only deficiencies come when Hollywood Burnouts stray a bit too close to their influences, such as the sleazy and slightly dis-harmonic leads on "Wild Side" that bear a striking similarity to those from G'n'R's "My Michelle". Not only do the leads on "Gimme, Gimme, Gimme" sport some definite Poison influence, but the strumming bass opening pulls directly from "Unskinny Bop". The flagrant imitations aside, of which there are thankfully very few, Excess All Areas is a really fun album tailor-made for hair metal fans. Hollywood Burnouts avoid letting modern stylings invade their work, instead remaining honest to their chosen genre.